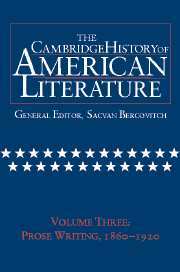 The Cambridge History of American Literature addresses the broad spectrum of new and established directions in all branches of American writing, and will include the work of scholars and critics who have shaped, and who continue to shape, what has become a major area of literary scholarship. These authors, who speak for the continuities as well as the disruptions sustained between generations of scholarship, represent the achievements of the last half-century in Americanist literary criticism. Generously proportioned narratives allow at once for a broader vision and more magisterial sweep of American literary history than has been possible previously; and while the voice of traditional criticism is implicit in these narratives, it joins forces with the diversity of interests that characterise contemporary literary studies.